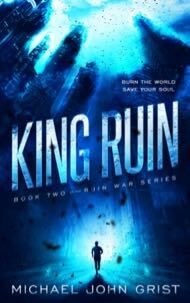 King Ruin is a Hard SF thriller, Book 2 in the Ruin War trilogy. Your soul is the war zone. In the fearsome battle with Mr. Ruin, elite Graysmith Ritry dived deeper into the fires of the mind than ever before. There he found the ‘Aetheric Bridge’, a crossing-point that links all souls throughout time, and unleashed its awesome power. Now that power has been noticed. King Ruin, a malevolent entity far greater than Mr. Ruin, wants the secret of the Bridge, and Ritry alone stands in his path. But Ritry is nothing compared to the King, and there’s nowhere left to dive. An ancient beast battles the elite Graysmith Ritry in the sunken world of the soul.